Much of the watermelon pink nursery ideas for baby girls' rooms on this page as well as the extraordinary baby bedding sets and decor were contributed by moms and dads that take DIY to new and unique heights. Their accomplishments leave me in awe of their imagination, ingenuity and savvy shopping skills. As you will see from the following nursery pictures that reveal cute color combinations and sewing tips; these are amazing individuals! Pink as with so many of the pastel color family can be tweaked (super-charged?) to include undertones that give it a whole new look. We have hot pink nurseries, coral pink nurseries and one of my favorites, watermelon pink nurseries! Think of it as the fresh and fruity shade of pink if you will. The large wooden monogram is painted in antique white or cream to match the color of the baby's crib and to provide contrast with the watermelon pink wall paint color selected for this lucky baby girl's nursery. Accessories in black include Annabelle's woven close hamper and the polka dot fabric of the window seat cushion cover give an approving nod to one of the most popular nursery color schemes for baby girls, the pink and black nursery which is stunning and dramatic no matter what shade of pink is chosen and aren't the wall letters by Jamie of Murals by Jamie gorgeous? Ruby's mom made her watermelon pink baby bedding set using a blend of fabrics. She made her own fitted crib sheet from soft minky chenille fabric that adds a bit of texture to the mix. 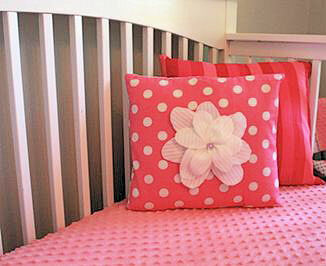 She also made a white, fabric flower and a polka dot pillow using a free tutorial that shouts "boutique" even though her watermelon pink nursery ideas for baby girls that she shared are all very economical and budget friendly. 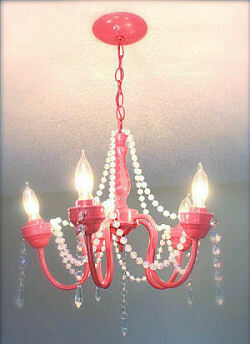 Pink Chandeliers are the crowning glory of every girl's room but they don't have to cost a lot of money. This ceiling light fixture was picked up for a song, re-wired, painted and dressed up with some sparkling crystal beads. The walls in this elegant nursery are painted using bold watermelon pink and white wall paint using a striped painting technique. The curves of yet another one of Jamie's lovely medallions are the perfect complement to the stripes. 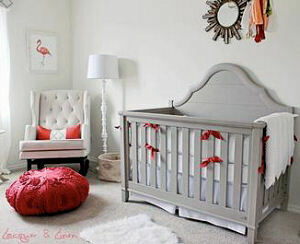 We have just shown you the watermelon pink nursery ideas so far that are bright and yes, bold. Coral pink and watermelon pink can successfully co-exist in the same room as long as there are spaces with neutral colors in between. A neutral color pallet benefits from a brightly colored pouf ottoman. I hope that visitors to Unique Baby Gear Ideas have enjoyed the pictures and the watermelon pink nursery ideas for baby girls and will stop by to see us again soon to check for updates and more projects shared by professional decorators as well as DIY decorators with lots of advice on how to save money on your next project.